(Nanowerk News) A*STAR researchers have developed a hybrid metal–polymer nanoparticle that lights up in the acidic environment surrounding tumor cells ("Tumor-Responsive Fluorescent Light-up Probe Based on a Gold Nanoparticle/Conjugated Polyelectrolyte Hybrid"). Nonspecific probes that can identify any kind of tumor are extremely useful for monitoring the location and spread of cancer and the effects of treatment, as well as aiding initial diagnosis. Cancerous tumors typically have lower than normal pH levels, which correspond to increased acidity both inside the cells and within the extracellular microenvironment surrounding the cells. 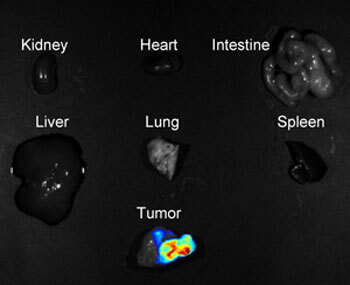 This simple difference between tumor cells and normal cells has led several research groups to develop probes that can detect the low pH of tumors using optical imaging, magnetic resonance and positron emission tomography. Most of these probes, however, target the intracellular pH, which requires the probes to enter the cells in order to work. A greater challenge has been to detect the difference in extracellular pH between healthy tissue and tumor tissue as the pH difference is smaller. Success would mean that the probes are not required to enter the cells. “Our aim is to address the challenge of illuminating tumors universally,” says Bin Liu from the A*STAR Institute of Materials Research and Engineering. Liu’s team, together with colleagues from the National University of Singapore, based their new probe on polymers that self-assemble on gold nanoparticles. The resulting hybrid structure is not fluorescent at normal physiological pH values: instead acidic conditions similar to those around tumor cells of approximately pH 6.5 alter chemical groups on the surface of the probes and switch on their fluorescence. After validating the switching mechanism in pH-controlled solutions, the researchers tested the probes using cultured cells and also in tumor-bearing mice illuminated under bright light. Twenty-four hours after injection into the mice, obvious and clear fluorescence was seen only from tumor-bearing tissue, using either whole-body imaging or examination of removed organs (see image). The ability to observe the fluorescence of tumors using noninvasive whole-body examination of living mice indicates the potential of the nanoprobes for use in clinical situations with human patients. “Our probes have so far proved to be biocompatible, which will be crucial for biomedical applications,” says Liu. “We now plan to check further for any toxicity issues and assess the biological distribution and pharmacological profile of the probes before hopefully moving on to clinical trials,” she adds. This is the latest of several recent advances in nanoscale medical technology from Liu’s group.